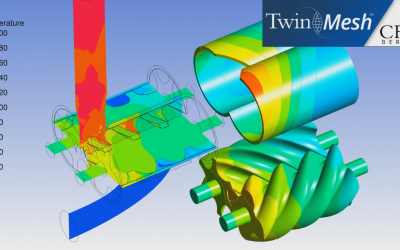 Preview on new features in TwinMesh™ 2019: CFD simulation of a SRM screw compressor with heating of rotor and casing solids with ANSYS CFX. 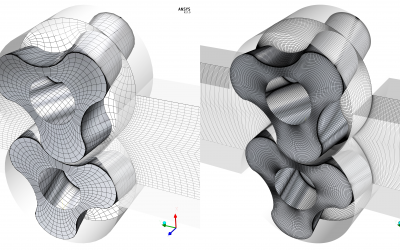 We implemented User Fortran routines in TwinMesh 2019 that connect non-overlapping parts of the fluid-fluid interfaces to the interior solid surfaces to account for temperature and heat flux exchange. The next preview of new features in TwinMesh™ 2019: we implemented a mesh interpolation method in User Fortran. So far, the time step size of the CFD simulation has to be set according to the desired revolution speed and the prescribed angle increment of the pre-generated meshes from TwinMesh. Now it is possible to set an arbitrary time step size, and the corresponding mesh is calculated with a spline interpolation between the pre-generated meshes at run-time. 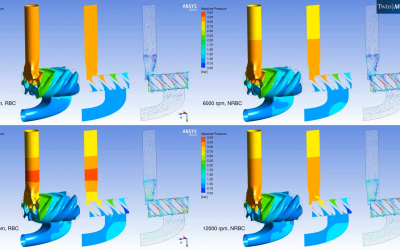 Preview on new features in TwinMesh™ 2019: we have implemented non-reflective boundary conditions (NRBC) in ANSYS CFX via User Fortran in a stable and robust way so that they can be used for positive displacement compressors instead of the standard openings which are reflective (RBC). While RBC lead to standing waves, especially at pressure side with mass flow strongly pulsating and even flow reversal, NRBC allow pressure fluctuations from pressure port to travel to the outlet and leave there without any artificial reflections so that mass flow is more uniform and realistic. New Release TwinMesh 2017 is now available. New features of TwinMesh 2017 include vane pumps and orbital motor as new machine types, variable pitch for screw machines, many function and GUI improvements and a tet grid generator for axial gaps. Click here to find out what is new in TwinMesh 2017! 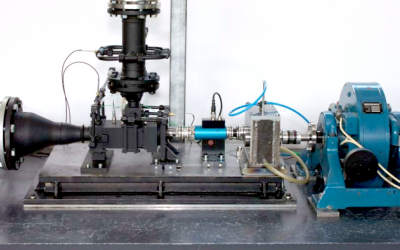 With its working principle of a positive displacement machine the scroll expander is a real challenge for 3D CFD. Luckily, BOSCH knows where to look for experts in that field. CFX Berlin provides the right tools, and experience to take such a challenge. Find here a presentation on numerical simulation of a scroll machine using TwinMesh and ANSYS CFX. 2016 has been an exciting year for us. With a steady increase in customer numbers we are very happy to welcome our latest TwinMesh users: Danfoss and Scherzinger Pump Technology. 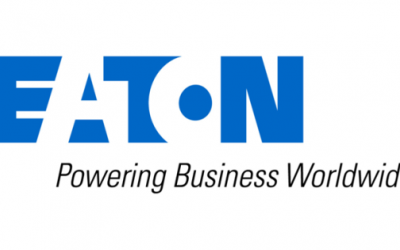 Moreover, we would like to share what Eaton has to say about TwinMesh and CFX. It Works! 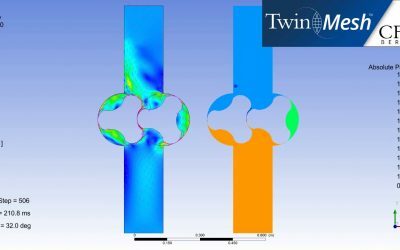 Read this Blog about CFD Simulation and Result Validation for a Twin Screw Expander Including Leakage Flows. Measurements come from TU Dortmund, CFD Simulation was done by CFX Berlin. 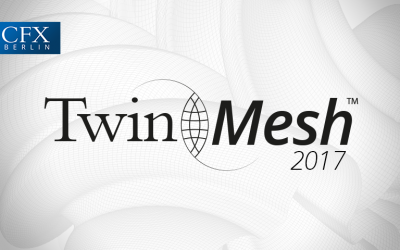 We are happy to inform you that our new release TwinMesh 2016 is now available. 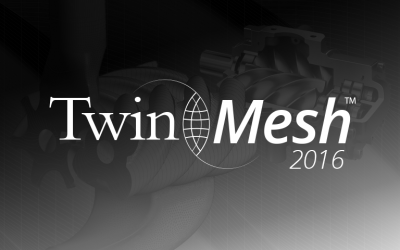 Find out what is new in TwinMesh 2016. 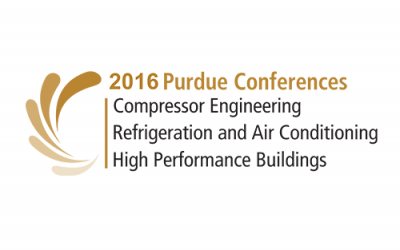 During the 2016 Purdue Conference on July 11-14 we had the opportunity to present two of our recent works on CFD of positive displacement machines. One popular topic was the industrial application of scroll machines. Find and read the full paper here! 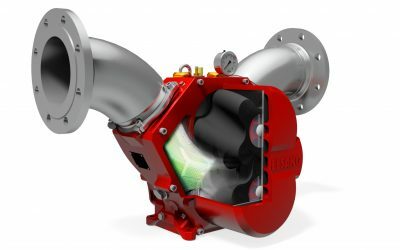 Hugo Vogelsang Maschinenbau GmbH, one of Germanys top leading rotary lobe pump manufacturers, uses TwinMesh for their CFD analysis to improve performance, durability, and life time for their rotary lobe pumps. 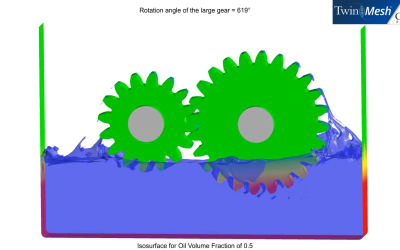 One of our Master degree students evaluates whether the combination of TwinMesh grids and ANSYS CFX simulation are helpful for gear box lubrication analysis. Although there are only first results available yet I found this video quite amazing and therefore decided to share it here in this Blog. 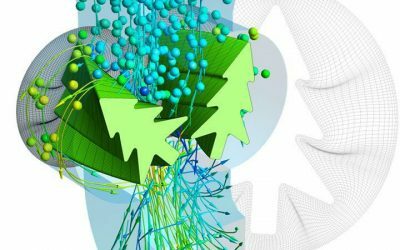 In order to produce reliable computational fluid dynamics (CFD) results, the mesh resolution can have a severe impact on both, qualitative and quantitative simulation results. In this short article we present data from three different cases where correct mesh resolution is inevitable. Read through the text, have a look at the data, and be stunned by the fact that a coarse mesh resolution and quality can give you poor and in the worst case unreliable results. 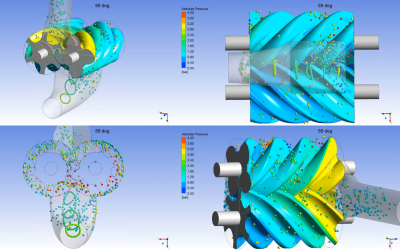 Video example for advanced postprocessing of screw compressor cfd results using script-based tracking of massless particles in ANSYS CFD-Post.